Presenting the first ever video released from upcoming family drama film Prem Ratan Dhan Payo. 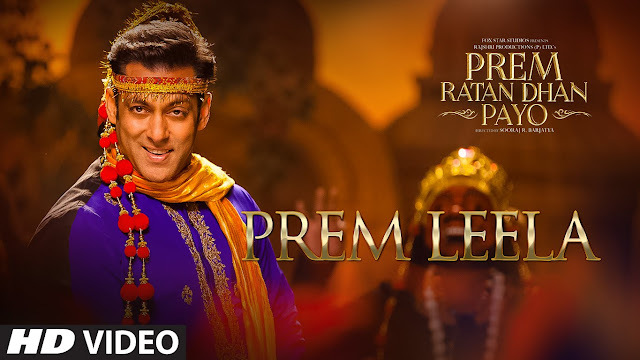 Celebrate this Diwali with Prem Leela which is sung by Aman Trikha & Vineet Singh, lyrics are from Irshad Kamil and music composer is Himesh Reshamiya. See Also : Prem Ratan Dhan Payo trailer collects 4M Views & 5K Dislikes in a Day! Prem Ratan Dhan Payo is a 2015 Indian family drama film, written and directed by Sooraj Barjatya. This will be the fourth collaboration between Sooraj R. Barjatya and Salman Khan after their previous blockbusters Maine Pyar Kiya, HAHK and Hum Saath Saath Hain. Salman Khan will be seen in Double Role,one is of prem who is a prince and other is of vijay who is a fighter. This is the first time that Khan will reprising double role since Judwaa. Ram Charan Teja to do a film with Salman Khan? Madhuri Dixit in Baahubali - The Conclusion? Shaandaar Movie Review : It's not much Shaandaar! Big B : Music Gave me Hope during Tough Times! Imtiaz Ali is just not interested in Acting! Priyanka Chopra AKA Roma is not a part of Don 3? Mahira Says ShahRukh Khan's energy is infectious! Dilwale : True Lovers are Back!